Throughout my career, each job and position I’ve held has utilized technology in some way. As a classroom teacher, I primarily used computers to keep myself organized and prepare materials for my students; I also taught a basic computer skills class for high schools students and frequently used video and photos to supplement content in the classroom. When I become a curriculum specialist, I again primarily used computers for the administrative aspect of my work – email, writing letters, scanning, file storage, etc. I often had to create resource materials for teachers and I began to learn digital photo editing, document publishing, graphic design, and I started to expand my use of the internet as a valuable resource for information and additional learning tools. Later on as I transitioned to community and youth development work and after school programming, technology had become a vital tool in my professional practice that I used on a daily basis. As I reflect on all these experiences, I realize that while I began with using technology as a tool to accomplish specific tasks, I quickly began to embrace its value and use in most aspects of my work. I found that technology was convenient, it helped me be more efficient and productive, it inspired creativity, it provided organization and was useful in documentation, and most importantly, it was increasingly becoming an important tool for connecting and collaborating with others. While I valued and used technology extensively in my personal life, I found that in my professional practice I was only using technology tools as I felt a need; if there was a gap or need for a technology solution, only then would I invest time and resources in finding an effective tech tool. I felt I had little time and resources to invest in finding and learning new tech tools that did not have an immediate relevance in my work. Perhaps this is one of the major impacts that the Learning Design and Technology program has had on my professional practice – I’ve learned to take a more proactive and intentional approach to integrating technology into my professional practice. I continue to use many forms of technology but I’ve also gained a broader understanding of how to use technology effectively and appropriately to meet various goals and needs. My personal and professional learning with and through technology is much more integrated now, rather than viewing them as separate areas of practice. I’ve been able to do this through my blogging throughout all my program courses, curating resources, engaging with my peers and a wider audience in Twitter, Google Communities, Forums, Discussions Groups, MOOCs, and Hangouts. These have helped me to be more critical in assessing needs for technology and more deliberate in evaluating and implementing tech tools. Collaborating with others has also greatly impacted my use of technology in my practice; learning at a distance has allowed me to develop and improve my communication skills and gain a deeper understanding of how technology impacts learning, dialogue, and content. Even the challenges, conflicts, and broader issues that come with technology have taught me how, when, and why to integrate technology in supporting learners and the learning environment. My Final (Givercraft) Reflection in the Practicum in Virtual Teaching and Learning is the best artifact for demonstrating my effective, creative, and conscientious use of technology up to this point in my practice. The multiple uses of technology for planning and preparing the course, communicating with teachers, and presenting course content – these were all evident in this artifact. From the research phase, to conducting needs assessment, to collaborating with the team of instructors, integration of technology was intentional and appropriate. If any aspect of the experience was not clearly defined or evident with the tools we had, we explored alternatives and found creative solutions with the information and tools available. There was an appropriate balance between using technology to stay organized and support effective communication, and using technology to effectively facilitate the virtual learning environment of MinecraftEdu and support the learning outcomes of the students. This artifact also provides evidence of how I met the ISTE (NETS-C) Standards related to effective use of technology. 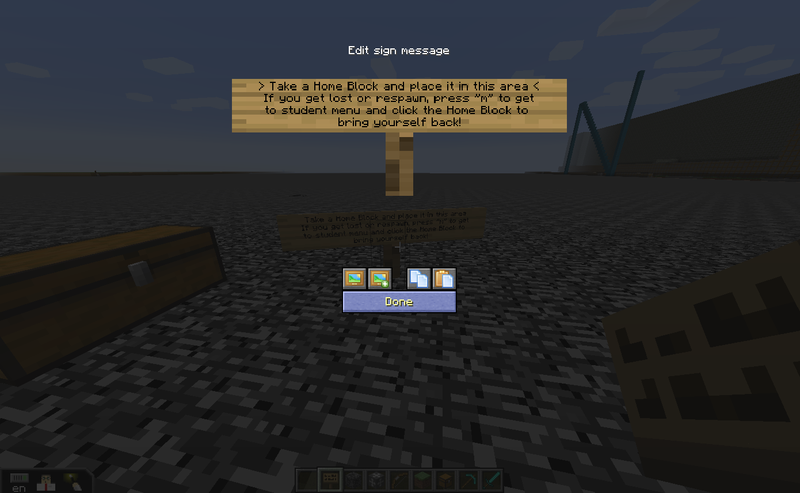 By using the Google Community to support the online course dialogue and manage technology issues throughout the practicum, I was able to interact and support teachers to identify and resolve issues with the MinecraftEdu client software, user authentication, server connectivity problems, and use of Teacher Tools within the gameworld. An important aspect of managing the experience was effectively transitioning all users between scenarios, which required real-time communication and coordination of the gameworld settings. By also using the Google Community as a forum for resource sharing and discussion about tools and strategies, I effectively modeled and supported Givercraft teachers to collaborate asynchronously and utilize resources from a variety of sources – Minecraft wikis, teaching forums, online videos, and most importantly, the valuable gaming knowledge and experiences provided by their own students! Another artifact that describes my contributions in our team to anticipate, mitigate, and resolve technology issues is my team meeting journal entry; building on previous notes and experiences from prior iterations of Givercraft, I was able to prepare tools and processes that would support teachers to have the support they needed. My blog entry for “Teacher Training Tools” from a previous Givercraft experience, demonstrates my knowledge and use of technology tools and resources to plan, implement, and facilitate an engaging learning environment. While the technology tools and resources may not be new or cutting edge ways to support teacher and student learning outcomes, they demonstrate that I prioritize use or new uses of the appropriate tools as well as being intentional about not including too many new tools that could frustrate learners and create unnecessary barriers to learning.